On the retirement issue, Chaffetz said his committee will push to move new federal hires to receive only a defined-contribution benefit, like the Thrift Savings Plan. He said he must “still work the math” as to whether those employees would receive a more generous government contribution toward the 401(k) equivalent to make up for the loss of a pension, but did promise a “healthy” match from agencies. Chaffetz promised to protect employees already vested in their pensions, saying he did not want to “unduly scare” an employee already on the job for seven years and it would be “difficult” to go after existing workers’ retirements. Chaffetz said he has spoken to House Speaker Paul Ryan, R-Wis., about his plans, and Ryan knows it is “on my list of to dos.” He added he has not worked out the avenue for the reform, such as whether it would be through a standalone bill or budget reconciliation. Rep. Gerry Connolly, D-Va., one of the top Democrats on the oversight committee, said his party would “resist” and “fight back” against any efforts to lessen federal employees’ compensation. Connolly said it was important to consider the context of President-elect Donald Trump’s proposed federal hiring freeze, the reintroduction of the Holman Rule and cuts aimed at feds in previous years. “It’s a cynical, destructive, dishonorable way to approach civil servants who work awfully hard for government every day,” Connolly said. 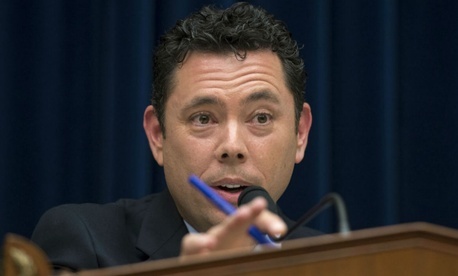 Chaffetz said his committee is considering ways to shrink the size of the federal workforce. Republicans are “looking at” legislation to require two or three federal employees to leave before agencies could hire one new worker. He vowed to avoid the “fallacy of the past” in which reductions in the federal workforce simply led to more contracted work. He said the committee will make a clearer definition for what constitutes sexual harassment and sexual assault for federal workers, noting it currently varies from agency to agency. The goal, ultimately, is to make “rules for them to be dealt with in a much quicker manner.” The committee has held multiple hearings on accusations of sexual misconduct at the National Park Service, with its director telling lawmakers he would welcome increased authority to deal with malfeasant workers. For his part, Connolly warned that “anyone can make an accusation” and targeting sexual misconduct may be “subterfuge” for a larger attack on due process rights in the federal workforce. Chaffetz expressed a wariness of pursuing across-the-board reforms to federal firing procedures, saying he would prefer to tackle the issue at individual agencies or in regard to particular issues. He also said Congress should pursue changes to the way agencies handle the Senior Executive Service separately from the rest of the federal workforce. The committee will look to expand the reforms aimed at expediting terminations for SES workers at the Veterans Affairs Department. “You’ll see that as we’re moving forward,” Chaffetz said. Still, Chaffetz said some civil service protections are “rightfully” in place, and President Trump may grow “frustrated” with his inability to dismiss employees at will. Running a “business empire,” Chaffetz said, is very different than running the federal government. He did, however, predict there would be some changes to the decades-old laws governing federal personnel. “Civil service reform is something I want to engage in, but it’s going to take some time,” Chaffetz said. “It’s not going to happen on Jan. 21st.” Current laws, he added, provide “far too much leniency” for federal employees. Hard-working employees who do the right thing deserve protections from the bad apples, he explained. Chaffetz will meet with the cosponsors of his bill to reform the U.S. Postal Service, including Connolly, this week and expects to reintroduce a bill very similar to the one that cleared the committee last year. The main point of contention is a provision to require all postal retirees to enroll in Medicare as their primary health insurance provider. The committee chairman also said he will push for a resolution expressing the “sense of the House” that federal agencies should seek more opportunities to put their offices and employees outside the Washington, D.C., area. The Homeland Security Department could relocate to Des Moines, Iowa, he cited as an example, saying it would save the government a significant amount of money. About 15 percent of federal employees work in the capital region. Chaffetz promised to not pursue exclusively measures aimed at “diminishing and dismissing” the federal workforce, noting there could be some areas where Congress should boost the compensation for government employees. Those working in information technology, for example, may need a pay increase, he said. The committee will maintain “a very important role in oversight,” Chaffetz said, but he added having a Republican in the White House will enable it to focus on the legislative side of things. “I’m very excited we get to actually do the reform part of this,” he said. The oversight responsibility will continue to shed a light on the Obama administration, with Chaffetz promising ongoing investigations into the Justice Department’s Fast and Furious operation, scandals at the Internal Revenue Service and the State Department’s handling of Hillary Clinton’s emails. To Connolly, the renewed focus on reform represents an about face.